So I got pretty creative celebrating 5 holidays in one day today! I’m cheating a little because August 4th was actually IPA day, but today is beer day, so I bought a Great Lakes Pale Ale today to pay homage to this glorious day. If you notice, I’m also celebrating my brother’s 40th birthday and National Underwear Day because dangit, I also observed Work Like a Dog Day! Lordy lordy, look who’s 40! I should also add that today is my brother-in-law’s sister’s bday! Happy “21st, ” Carolyn! happy underwear, IPA, beer, work like a dog, birthday! I gotta throw some science into this, so check out the Oatmeal’s 20 things worth knowing about beer! 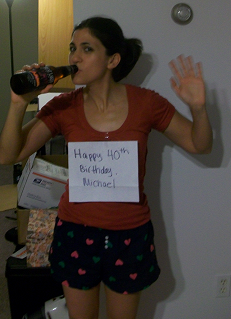 So celebrate wearing underwear, drinking beer, working like a dog, and my brother’s 40th birthday early and often! ← Happy National Underwear Day!